ARE AVAILABLE TO CUSTOM ORDER. Maintenance free long life LED lights, etc. 7-Pin rectangular plug for electrical connection to vehicle (does not charge or power hydraulics - see below). PLEASE NOTE: Photos are not of the actual trailer for sale. The trailer being offered is effectively an identical unit but may be subject to minor variation as improvements and enhancements to the design are ongoing. Actual size is as per this listing but the photographs of features may possibly be from a different size trailer (as 20x8 to 30x8). WHY BUY AN ENERGYTECH TRAILER? Australian design & specifications Local knowledge & Australian compliance means hassle-free ownership. Fantastic Value Aussie design utilising low-cost offshore labour = Australian quality at great value. Everything comes included NOT a single hidden extra to be found! All new parts Peace of mind with NO used parts (as some other suppliers do). Hot dip galvanised (up to 20 ft) Hot galvanising is the BEST anti-rust treatment available. Long trailer life. This tiny house trailer will last and last and last. The trailer is constructed with hot-dipped heavy steel box section chassis and frame, checker plate floor, and quality running gear and the heavy duty construction ensures that, when used with appropriate care, the trailer should provide many years of reliable service. Energytech trailers are robustly built and should require minimal maintenance during their life. In an endeavour to produce a quality product at an affordable price, ENERGYTECH designs our trailers here in Australia but we have all components manufactured in China (to our specifications). We import these components in bulk for final assembly at our Queensland facility. Some individuals still have reservations about purchasing Chinese products. The reality is China is now a source of high-quality goods with thousands of well-known companies doing their manufacturing in China. A large percentage of what you own (or parts of what you own) have been made in China. We are confident our trailers are a quality product that is equal to (and often better than) any similar locally fabricated product. Come and see for yourself! As we do not have any machinery, equipment or staff for special fabrication or modification of trailers or trailer components here in Australia we are generally unable to offer local 'custom' fabrication work however special custom indent orders are possible. NOTE: Prices are subject to change without notice. Trailers are subject to sale elsewhere and may be withdrawn if sold. PLEASE CALL to check availability. If you want to place an order we ask for a 30% deposit to secure your trailer in the production schedule. If you subsequently cancel your order Energytech may withhold 10% of the deposit to contribute to costs incurred. Assembled trailers are generally fully ready to be registered! We do not arrange registration as owners ID is required to register a trailer AND often clients are interstate and should register the trailer in the destination state. Trailers can be collected from our Brisbane premises or we can ship interstate. Alternatively, we are happy if you want to find and arrange your own shipping. However, your freight company of choice MUST HAVE a Brisbane freight depot for receipt of the trailer. 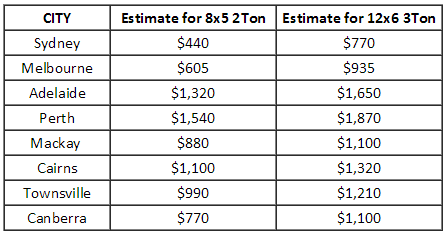 The following freight estimates are for delivery to a city freight depot and are to be used as a GUIDE only as freight prices fluctuate. WA and NT are generally very expensive. If your city is not listed or you require a firm quote for shipping please contact us. NOTE: Whether we (or you) arrange shipping, upon our delivery to the shipping company, any risk during transit passes to the purchaser. You may choose to arrange insurance to cover transportation risk. Warranty is a 12-month parts warranty. i.e. Should any component fail during the warranty period ENERGYTECH undertakes to either replace the part or provide a refurbished part on an exchange basis. Energytech trailers are robustly built, are all hot dip galvanised and should require minimal maintenance while providing many years of faithful service.